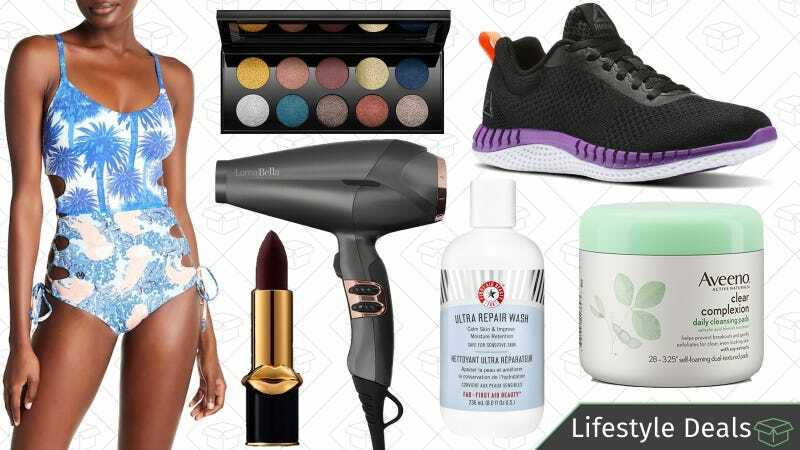 Sitewide discounts from Pat McGrath Labs, hair styling tools on Amazon, $30 Reebok sneakers, and more lead Friday’s best lifestyle deals. At this point, Pat McGrath is beauty royalty. Her unmatched skills as a makeup artist are only rivaled by her ability to create stunning makeup products. USe the code MILAN and take 15% off everything on her website, including her Subversive and Subliminal palettes and Mattetrance lipsticks. First Aid Beauty is the solution to pairing down your skin care, and right now, they’re taking up to 65% off some of their insanely-popular (and great) Ultra Repair products. Give your skin a redo with an Ultra Repair Body Lotion Wash and Mist Duo and help calm down the usually inflamed and dry patches that happen in the cold weather. I’ve recently been into Aveeno’s Positively Radiant moisturizer. It smells great, makes my skin glowy and not greasy, and has a broad spectrum SPF 15. If you also love Aveeno or want to try out a new drugstore brand for less, clip this coupon and get 40% off all Aveeno products on Amazon. Make your running shoes look like they belong in your closet with this Reebok sale. Use the code RUN29 at checkout and grab select running shoes for just $30. Choose from Astrorides, Ultraknits, and more styles at a price that’ll make you want to pick up two pairs. Pack lighter and get more from your swimwear with this Maaji swim sale at Nordstrom Rack. The brand makes insanely good-looking swimwear, which would be enough, but all of their pieces (including one-pieces) are reversible. Get two bathing suits for the price of one, and that price is half of what it normally is during this sale. Plus, there are coverups and workout gear included in the sale as well. The weather wants to be nice, I feel it. If your cabin fever has ramped up after the nice days that have popped up lately, Mountain Hardwear’s Winter Sale is for you. Everything you could need gear-wise for getting (and staying) outside is 30% off, from jackets and outerwear, to sleeping bags and tents. Seriously, there are over 250 items marked down. Note: If you sign up for the Elevated Members program, you’ll get an extra 10% off. Timex makes one of your favorite affordable watch, the Weekender. And, it’s that about time you got yourself a decent timepiece that you aren’t afraid to wear every day. Timex is knocking an extra 25% off their sale styles for men and women, Weekender included, when you use the code WATCH25 at checkout. Everyone needs new jeans at some point, and if that some point is right now, this True Religion sale at Nordstrom Rack is for you. Denim for guys and girls are on sale, plus tees and jackets, so your spring wardrobe has been figured out. I currently own five Funko POP! Figures, all Star Wars, most sitting on my desk at work. They’re adorable, and highly accurate, and ThinkGeek has them on sale right now for up to 70% off. POP! Figures are the perfect desk accessories for showing off your allegiance to pop culture, whether it’s action movies or video games or Bob Ross. 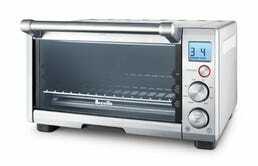 Breville’s excellent Smart Ovens don’t go on sale often, but Amazon’s currently offering solid discounts on several different models today. You can take your pick of the space-saving Smart Oven Mini, the mid-sized 650XL, or the massive and convection-equipped 800XL. None of these prices are as good as what we saw around Black Friday, but otherwise, they’re very sold deals. I got the 650XL as a wedding gift a few years ago, and it’s still one of my favorite and most-used pieces of kitchen equipment. 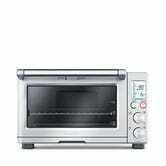 Cooking for two, I use it as my main oven for almost all of my recipes, as it preheats significantly faster than a real oven, and doesn’t heat up my entire home. 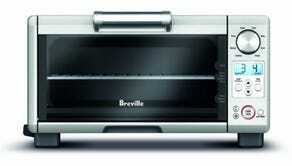 And in case you missed it earlier this week, the Breville Quick Touch microwave is also on sale for $200. Who has time to chop vegetables by hand? This Cuisinart food processor will make quick work of your kitchen chopping duties, and you can get it for $65 today, which about $5 - $20 less than usual, and matching Amazon’s all-time low. Your first duty: Use it to make homemade salsa. 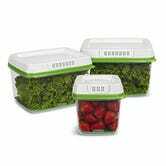 This 3-pack of best-selling Rubbermaid FreshWorks Produce Storage containers is not at its lowest price, but it is a good $5 - $7 less than usual. For $21, you get one 6.3-cup and two larger 17.3-cup containers. These containers can keep food fresh for about 80% longer than store packaging, but, if history is any indication, this deal won’t last long! You have to buy toilet paper anyway, but paying full price is basically just flushing money down the toilet. 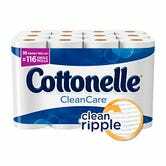 Get 36 rolls of Cottonelle Clean Care for $18 when you use Subscribe & Save (you can cancel any time) and clip the 20% coupon on the product page. Time to get comfy, because Urban Outfitters is having a home sale. Take an extra 40% off every home good that’s already on sale. That includes decor, furniture, bedding, even flatware. Just try not to go overboard because you may never want to leave your newly redecorated apartment (though, I don’t blame you). If you’ve been waiting for a good deal to pick up an iPhone X, T-Mobile just launched two of the best we’ve seen so far. First, if you buy an iPhone X, trade in an eligible device (there’s a list linked on this page), and fill out a rebate form, you’ll get a $200 prepaid MasterCard, which is as good as cash. Alternatively, if you buy any recent recent iPhone, including the X, and trade in another device, you can get an iPhone 8 for free. In terms of value, that’s the better deal, assuming there’s someone in your family who could also use a new phone. Prefer Verizon? Don’t miss this deal we posted earlier in the week. 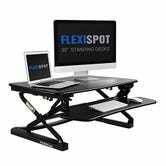 If you want to try a standing desk, but you’re not ready to commit to it for eight hours a day, this FlexiSpot monitor riser is on sale in Amazon’s Gold Box for $245, today only. Even as a Gold Box deal, this isn’t the cheapest standing desk riser we’ve seen, but it has a few features that you won’t find on most alternatives. For example, rather than extending up and out, it rises straight up and down to save space. Its keyboard tray is also height adjustable, and can even be removed completely with a quick release. That means you can put your keyboard and mouse on your actual desk when you want to sit down, which can be more comfortable.